I took to the lake with SKA founder Tim Sizemore on a windy, gusting postfrontal day; not the best prescription for finding those big prespawn females. This Spring has been a quirky one to say the least. Extraordinary weather pattern shifts, blustery cold fronts, and massive amounts of rain pushed the prespawn and spawn way behind schedule. The females are pushed back off the spawning grounds to retreat to staging areas and heavy cover; a cycle that repeats itself with each passing cold front. Big bass often escape bright skies and tough conditions by burying into heavy cover. Your only option is to "go heavy" and engage them from close range in dense cover. I call it CQB fishing. "Close Quarters Combat (CQC) or Close Quarters Battle (CQB) is a type of warfare in which small units engage the enemy with personal weapons at very short range from proximity hand-to-hand combat to close quarter target negotiation with short range weapons." 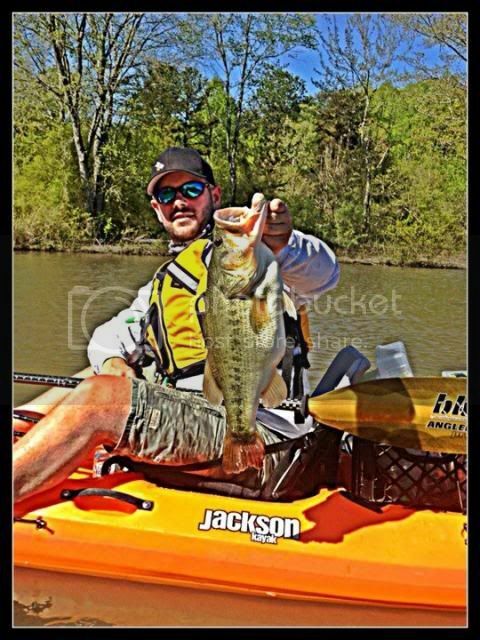 The physics of heavy cover fishing from kayak is very different than flipping from a bass boat. Leverage, the most important aspect, is diminished in a kayak. When you set the hook from a boat, you are able to put immense amounts of torque and force into the hookset, transfer that power to the fish, turn their head and get them moving in your direction, and wrench them boatside; overcoming the fish's strength and weight. In a kayak, you lose almost all of your force for the hook-set and the fight. Ever get a lure hung and pull against it? Right, it pulls your boat to the hangup. Those physics translate into lost hook-set power. You set the hook, your boat moves instantly towards the fish and you lose that much of the force and torque. You are sitting on a very moveable object and a great portion of that hook-set power in transferred into pulling your boat, and yourself, towards the fish. Even worse, with a fish on the line, you lose the leverage needed to pull the fish out of the cover as your boat is moving towards the fish. You need specific tackle to overcome these physical limitations. Today, I was flipping Texas rigged creature baits, pegged Elite Tungsten 1/2oz weights,65 pound braid and, my weapon of choice for CQB bass fishing, a Dobyns Rods 735C Champion. You must have a powerful rod with a ton of backbone, yet a bit of forgiveness in the tip, to stick the fish, keep the hook pinned, and wrestle it out of thick cover. The Dobyns 735, a stout 5 power, has a tremendous backbone and can stick and control big fish. 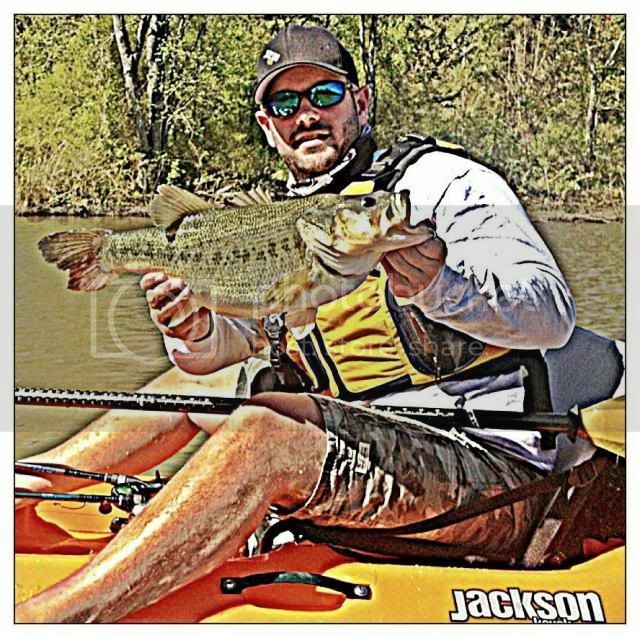 My motto is “Go Heavy” and step up a power rating for kayak fishing to increase the hook-set power and overcome the physics of kayak fishing. For baits, creature baits on stout hooks, topped by pegged tungsten weights offer big fish appeal, but snakes through cover with ease. A big misconception is that jigs are for flipping into heavy cover, but they are exponentially more snag prone than a Texas rigged soft plastic. Drag or hop those jigs in open water around boat docks and sparse cover. Peg your sinker with a bobber stop, toothpick or plastic peg to keep the weight from sliding up the line and getting hung up on sticks and limbs. This makes a compact package that snakes through cover and gets to the big ones without getting hung up and messing up your presentation. Flip your bait past the cover and work it into it, dropping into every nook and crevice. Hit it from several angles; big bass can be picky under high skies. Stay strong, stay ready! Not every piece of cover has a bass, so stay persistent and hit every item of cover you find; sometimes the ones you don't expect are the ones that hold the big ones. Especially look out for isolated items, different from surrounding cover; the largest stump in a stump flat in this case. When you feel that thump, thud or unnatural pressure, reel down and stick the fish as hard as you can; you can't set the hook too hard in this scenario. Then, keep your rod tip high and power reel to turn the head and get that fish moving in your direction as quickly as possible. Braid is essential. Normally, I am a big proponent of mono-filament and a little stretch, but in this scenario you don't want a millimeter of give in your line. Hook penetration and raw winching power is a necessity. On a side note for braid, I use 65 pound test because braid is actually very brittle and susceptible to nicks, cuts and wear and 30-40 pound braid can break with surprising ease. 65 pound test has just the right balance of abrasion resistance vs. diameter. This big girl had a bloody tail, evidence of spawning activity, but she had not dropped her eggs. I found her hiding under a massive, overturned stump in a deep channel between two spawning flats; a hideaway from the high pressure and bright skies and I had to go in after her. I flipped the creature bait past the stump, lifted and popped it across a limb, and dropped it into the middle of the mess. A solid thump and I snapped a hard hook-set and held it for what seemed like a minute. Nothing budged and I thought for a fleeting second I had set into the stump itself when I felt the live weight of the bass. Leaning into the 5 power rod, I wrestled the big out of her hole and into open water where she went ballistic on the short line. I moved the rod tip in figure eights to keep her moving until I could lip her and haul her into my Jackson Coosa. This is my kind of fishing; heavy line, heavy cover, and short, intense battles! Sweet pics but you need to add some paragraphs in there.... It's very hard to read.